PE Series slewing drives are the ideal solutions when precision is a must as these products can be controlled between 0.05° and 0.15°. The S Series is comprised of four separate components: a slewing ring, the open housing, auxiliary parts and hourglass worm. HSE Series slewing drives have the ability to withstand large axial dynamic loads due to the structural design of the product. 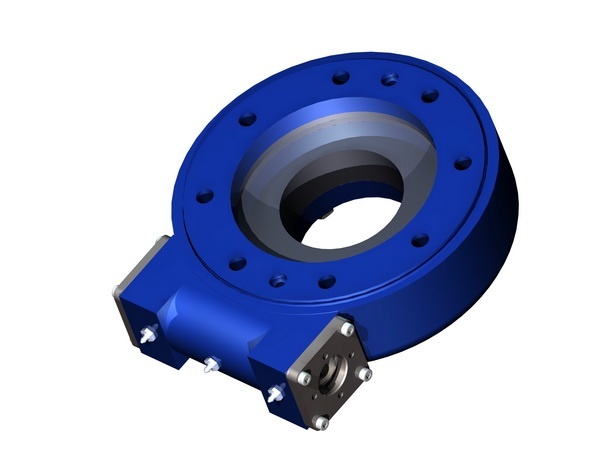 The SE Series slewing drive is a dual worm slewing drive consisting of two hourglass worms, a slewing ring, enclosed housing and supporting parts - resulting in double tooth contact and increased torque capabilities. For more information on the WEA Series slewing drives or to request a quote, contact SlewPro today. You can also download CAD files and find competitors crossover numbers in our database. 6.5 kN.m 33.9 kN.m 38.7 kN.m 338 kN 135 kN 81 kN 71 kN 61:2 ≤ .17° 81 lb. 7.5 kN.m 54.3 kN.m 43 kN.m 475 kN 190 kN 114 kN 100 kN 78:1 ≤ .17° 90 lb. 8 kN.m 67.8 kN.m 48 kN.m 555 kN 222 kN 133 kN 117 kN 85:1 ≤ .17° 103 lb. 10 kN.m 135.6 kN.m 72.3 kN.m 970 kN 390 kN 235 kN 205 kN 85:1 ≤ .17° 191 lb. 12 kN.m 67.8 kN.m 48 kN.m 555 kN 222 kN 133 kN 117 kN 85:1 ≤ .17° 167 lb. 12 kN.m 67.8 kN.m 48 kN.m 555 kN 222 kN 133 kN 117 kN 85:1 ≤ .17° 136 lb. 16.8 kN.m 135.6 kN.m 72.3 kN.m 970 kN 390 kN 235 kN 205 kN 102:1 ≤ .15° 262 lb. 16.8 kN.m 135.6 kN.m 72.3 kN.m 970 kN 390 kN 235 kN 205 kN 102:1 ≤ .15° 224 lb. 21.8 kN.m 26.6 kN.m 167 kN.m 1058 kN 421 kN 265 kN 216 kN 82:1 ≤ .15° 409 lb. 43.6 kN.m 52.3 kN.m 167 kN.m 1058 kN 421 kN 265 kN 216 kN 82:1 ≤ .15° 453 lb. 25 kN.m 30 kN.m 271 kN.m 2360 kN 945 kN 590 kN 470 kN 94:1 ≤ .15° 561 lb. 50 kN.m 60 kN.m 271 kN.m 2360 kN 945 kN 590 kN 470 kN 94:1 ≤ .15° 605 lb.